I’d come face to face with Tuesdays with Morrie multiple times earlier. The encounters had always been awkward. After all, I couldn’t just say, “Hey, I’m sorry but you’re not my kind.” It was one such chance encounter while traveling that I met the book again. Ashamed, I decided to give it a go. A recommendation from my husband gave me courage to go on that first date with the book. Who knew I was in for such a surprise? I was hooked after reading just the first few pages. Tuesdays with Morrie, written by Mitch Albom, revolves around a dying man’s learnings about life, death and everything in between. But I connected even more with how these reflections force his favourite student, Mitch, to stop and ponder over where his life is taking him. The story begins at Brandeis University, where Mitch is a student, in the spring of 1979. Morrie, a professor at the University, teaches sociology, instead of the “real world skills” of accounting and finance. Morrie soon becomes Mitch’s mentor, pushing him to pursue his interests and develop a humane worldview. At his graduation, Mitch promises that he’ll keep in touch. But as most other student-teacher relationships, this one too, was pushed to the back of Mitch’s mind with the prime real estate being taken up by the usual suspects – need to make money, buy a house, own a car,get that promotion. It was only after a decade and a half that Mitch hears of Morrie again. It isn’t happy news – Morrie is dying of Lou Gehrig’s disease. It is then that Mitch reconnects with his old professor who begins teaching the final course of his life, a course on living, loving, and accepting yourself and others for who we really are. The book, itself only 192 pages long, is written from Mitch’s point of view, as he first learns of his professor’s disease and then speaks with him about life over multiple sessions. 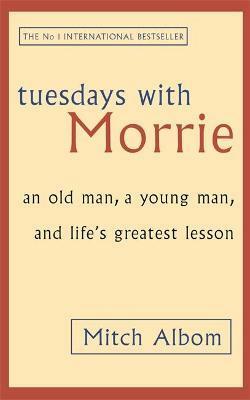 It is structured into short chapters around 14 Tuesdays that Morrie and Mitch spent together, each dealing with a specific theme. The themes range from family, emotions and the world to death and regrets. Though the book might feel preachy at times and doesn’t say much that most people don’t already know instinctively, I loved the lucid and clear expression, which will make you read a page again – just so that you can absorb the depth of what was said in a few lines. It delves into the most basic truths of our existence. Morrie made me stop and think about the life I am leading and the choices I am making. I could easily find more than a couple of changes to make. It beautifully sums up the endless loop we are in, where we anchor our happiness to external events. Morrie invites the reader to stop, stand still, think and break out of this rut. For me, this book also has an army of unsung heroes – Morrie’s family – who stay by his side day and night, till the very end. Morrie couldn’t have told his story if his family and caregivers weren’t working away silently, tirelessly to help him make the most of his days. More than his words, it is these people who strongly reinforce the need to focus more on people than material things. In the end, it’s the people - living in the house you built, riding pillion on the bike you bought, laughing and dining with you in that expensive restaurant – people… that really matter. And Morrie teaches us to slow down and appreciate them. This is when TOM decided to pay me a visit. Long overdue, after our previous conversation, but certainly unasked for. TOM: Hey there! What happens if we replace “Children” with “Parents” in that line? TOM: Why do you not speak? You haven’t been home in the past two months. That’s surely a first. You must have a reason. Me: You know I’ve been travelling. And now my trips are split between Delhi and Jaipur. How can I possibly maintain the same frequency of visits as before? I also have critical deadlines approaching at work. If I don’t stay here and work hard, how will we ever get to launch the project? TOM: Did your company collapse while you were away for a month? Me: No. But that’s because all systems are designed to be person-independent. Work has to go on. TOM: So you’re staying away from home to work a job where you are completely replaceable? And this takes you away from your family, where you are irreplaceable? And you’re OK with this? I don’t understand the times we’re born in. TOM: No! I’m the one in-charge of talking today. I understand, you get some “learnings” from your job. You’re building your own story. You’re making an “impact”. You “grow and develop” as a professional. Maybe even as a person. And of course, it gets you the money. But, at what cost? What will you do when you see them lying there motionless, leaving you utterly helpless? Can your learnings and your money buy you a ticket on the train of No Regrets? A second chance? Forget that, you won’t even be able to reach home fast enough. You’ll never know which visit becomes the one that you saw them last. You shouldn’t be saying all those things! TOM: That won’t change the reality. You push your family to a deep dark corner of your mind. You know what happens where there is no sunshine. Don’t spend your life mindlessly working one job after another, moving from one city to another, chasing moving goal-posts. There will always be that promotion, that increment that will be held out as a carrot to you. But what won’t always be around, is your family. And trust me, nobody is affected by your presence (more appropriately, absence) more than them. They are trained too to not show any emotion. Or maybe they also work on the assumption of infinite time. Or maybe, they’ve just accepted the witch’s lament as their fate. It’s in your best interest. Having had the last word, TOM disappeared. For once, the conversation was complete but I was left feeling hollow inside. It forced me to acknowledge things I didn’t want to. It left a bad aftertaste. And all I could do was look out at the sky, watching airplanes disappear into the clouds as they left this city behind, wishing one of them would take me along.